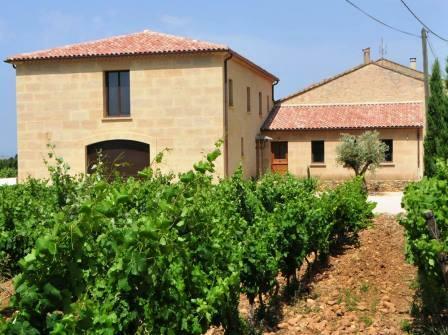 Located in the north of Chateauneuf du Pape, not far from the ancient Roman city of Orange, Mas de Boislauzon is managed by Daniel Chaussy and Christine Chaussy. Daniel Chaussy and Christine Chaussy, brother and sister are the sixth generation in their family to manage Mas de Boislauzon. The Southern Rhone Valley domaine takes its name from the lieu-dit where some of their their vines are planted, Boislauzon. Those vines are special for the estate as they are where their oldest Mourvedre vines are planted. Mas de Boislauzon owns 9 hectares of vines in Chateauneuf du Pape. 8 hectares are used for the production of red wine grapes. 1 hectare is reserved for the white wine. The vineyards are in 15 parcels located in various terroirs and sectors including of course the Boislauzon, Cabrieres, La Gardiole, Palestor and Pignan lieux-dits. Depending on the vineyard, they have a terroir of sand, rocks and clay soils. Aside from vineyards in the Chateauneuf du Pape appellation, Mas de Boislauzon also possesses 15 hectares of vines in Cotes du Rhone. The estate practices biodynamic farming techniques. In 2012, Mas de Boislauzon were certified agriculture biologique. With 6 generations of wine making in the family, the wines produced today at Mas de Boislauzon today are stunning examples of what Chateauneuf du Pape does best. Like many Chateauneuf du Pape growers, the vines of Mas de Boislauzon are located in different sectors spread across the appellation. Most of their terroirs are sand, loam and limestone, rocks and clay soils. Their oldest, most prized vines are their Mourvedre, which on average are a respectable 70 years of age. Sorting takes place in the vineyard and again at the cellars of Mas de Boislauzon. They do not destem the grapes. Alcoholic fermentation takes place in traditional cement vats. Generally speaking, the grape varieties are fermented separately, although some of their Grenache and Mourvedre are co fermented in the same vat. Wines are aged in tanks and small oak barrels, depending on the wine and the variety. The best vintages of Domaine Mas de Boislauzon are: 2018, 2017, 2016, 2015, 2012, 2010, 2009, 2007, 2005 and 2003. Domaine Mas de Boislauzon produces 3 red Chateauneuf du Pape wines and and 1 Chateauneuf du Pape Blanc. Mas de Boislauzon Chateauneuf du Pape Tradition is usually a blend of 70% Grenache and 30% Mourvedre, although there are vintages when Syrah is also included as well. The terroir is a mix of rocks, stones, sand and limestone soils. The vines are planted in the Bois Lauzon, les Brusquieres, les Cabrieres, Palestor and Pignan lieux-dits. The wine is aged in concrete vats for about 12 months. The production is close to 2,500 cases per vintage. Mas de Boislauzon Le Quet, which made its debut in 1996, is a blend of 80% old vine Grenache and 20% Mourvedre. The Grenache comes from old vines that average about 80 years of age. The wine is aged in 50% neutral oak and 50% concrete vats for about 12 months. The production is 425 cases per year. Mas de Boislauzon Tintot is possibly the only wine in Chateauneuf du Pape produced from 100% old vine Mourvedre. In fact, the name Tintot is an old term for Mourvedre. Although some vintages can also include Grenache in the blend. The vines are old, many are more than 80 years old! The vines are planted in a single parcel. Tintot made its debut only a few years ago, back in 2006. The wine is aged in a combination barrels that range from 1 to 3 years of age for 12 months before being moved to concrete vats where it rests for an additional year before bottling. The production is small. On average slightly more than 1,500 bottles are made in a good vintage! It’s hard to find, but worth the effort. However, the wine is not made every year, it is only produced in the best vintages. Mas de Boislauzon Chateauneuf du Pape Blanc is produced from a blend of 25% Grenache Blanc, 25% Clairette, 25% Roussanne and 25% Bourboulenc. Aged in barrel, the production is 250 cases each vintage. 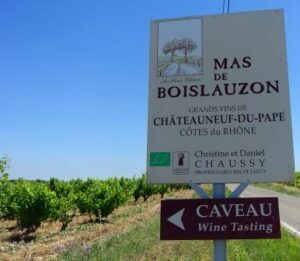 Aside from producing stunning Chateauneuf du Pape wines, Mas de Boislauzon makes a strong Cote du Rhone village wine from 15 hectares of vines. The wine is a blend that is usually close to 70% Grenache, 20% Syrah and 10% Mourvedre. In 2012, Mas de Boislauzon added a Vin de France to their growing portfolio. La Chaussynette, a blend of 70% Grenache and 30% Syrah sells for a song for a wine of that level of quality. Mas de Boislauzon can be enjoyed on the young side with 1-2 hours of decanting. This allows the wine to soften and open its perfume. Older vintages might need very little decanting, just enough to remove the sediment. Mas de Boislauzon is usually better with at least 5-7 years of bottle age. Of course that can vary slightly, depending on the vintage. In the best vintages the wine should be consumed within 5-25 years after the vintage. Mas de Boislauzon is best served at 15.5 degrees Celsius, 60 degrees Fahrenheit. The cool, almost cellar temperature gives the wine more freshness and lift. Mas de Boislauzon is best served with all types of classic meat dishes, veal, pork, beef, lamb, duck, game, roast chicken, roasted, braised, stewed dishes, sausage, grilled meats, barbecue and cassoulet. Mas de Boislauzon is also good with Asian dishes, hearty fish courses like tuna, mushrooms, cheese, pasta, eggplant and tomatoes. The white wine of Mas de Boislauzon is best served with a myriad of different seafood dishes, shellfish, crab, lobster, sushi, sashimi, chicken, pork and veal, as well as Asian cuisine. Deep in color, the wine pops with ripe, juicy, dark, sweet, spicy, round, peppery fruits. Silky, lush and powerful, graceful, fresh and long, this is just great juice! This should age quite nicely. The wine was made from blending 80% Grenache with 20% Mourvedre. Flowers, spice and incredibly sweet, fresh ripe red berries are all over the place here. There is texture, freshness, length and character that leaves with a spicy kirsch and pepper note in the juicy finish. The wine was made from blending 70% Grenache with 30% Mourvedre. This remains one of the best bargains in Chateauneuf du Pape for character and quality today. Almost opaque in color, there is a richness that comes from old vines that cannot be lost, even if you tried. Spicy and dense, the wine coats your palate, but with elegance, and not just extract. Light on its feet, due to the freshness, the wine sticks with you and just doesn't want to leave. The end notes carry through with a black cherry and plum liqueur essence that you just want more of. The wine was made from a blend of 85% old vine Mourvedre and 15% Grenache. This is really great juice that deserves to be tasted! With a dark, red hue to entice you, the wine is fleshy, concentrated, lush and luscious. There is a spicy character and purity to the fruit that is a treat. The finish keeps on going with all its peppery, red and black fruits. This should age quite nicely. Spicy, polished, fresh and elegant, the wine serves up loads of fresh, spicy, red berries, stony tannins and peppery, fresh red berries from start to finish. The wine was made from blending 65% Grenache with 35% Mourvedre. This top wine is one of the best bargains in Chateauneuf du Pape for character and quality today. Light in style, elegant and refined, with freshness and sweet, pure, clean, spicy, red fruits are all perfectly wrapped up in a forward style. In 2014, only one wine was produced here. All the other wines normally released by the domaine were blended into their Chateauneuf du Pape. Luscious, dark red fruits, soft, round textures and a liberal splash of sweet, black cherries in the finish. The wine was created using a 50/50 blend of Grenache and Mourvedre. Showing just a hint of lightening at the edges, sultry is the best way to describe it. Mouth filling, rich, long, and intense, there is good density and a finish that sticks with you. The wine was made from a blend of 80% Grenache and 20% Mourvedre. This is a super wine. Stylish, character driven, rich, full bodied with concentration and depth of flavor. Blending 80% Grenache and 20% Mourvedre produced a spicy, dark, red berry filled wine with an earthy, meaty, lusty character. With a few years in the bottle, this will be even better. Showing good depth of color, the wine pops with Provencal herbs, olives and black cherry. Plush and polished, there is a richness and depth to the fruit and a roundness to the tannins. This is just starting to be fun to drink now, but it should also improve a bit with more age. The wine was made from a blend of 75% Grenache, 20% Mourvedre and 5% Syrah. Opaque in color, this intense wine is packed with smoke, coffee, earth, plum liqueur, molten black cherries and an array of spices. Dense, concentrated and tannic, this sensational, rich, powerful, palate coating, Chateauneuf du Pape will need a few years to come together. From 100% Mourvedre, with vines that average at least 80 years of age, this inky, black wine is stunning! Licorice, blackberry liqueur, herbs, ripe black cherry and smoke aromas explode from the glass. Fat, sassy and packed with multiple layers of rich, ripe, dense sweet, pure fruit, this massive, intense wine fills your mouth and palate with flavor and velvet textures in the long, polished finish. This fabulous, rich, concentrated, earthy, black cherry and spice filled wine is a great value for its quality. The wine is tannic and demands a few years in the cellar to soften, but it's worth the wait for this stylish Chateauneuf du Pape. Licorice, jammy black cherry and pepper aromas are matched with a deeply colored wine that ends with ripe, sweet, fleshy, black cherries. This fun, well priced wine is already drinking well. From 100% old vine, Mourvedre, the wine is incredibly dark in color. The nose, with its spicy melange of black fruits, flowers and herbs gets the wine going. On the palate, the wine is rich, fat, deep, concentrated and lushly textured. Still young, this should be better in 5, 10, 15, 20 or 25 more years as it has the stuffing to last. With a production of only 300 cases, if this is a wine you want to cellar, grab a few bottles now, because sooner or later, it will be close to impossible to find. Rich, ripe, intense and juicy, this lusty, dense wine is packed with fresh, sweet, kirsch, black raspberry, pepper and a hint of black cherry jam. Young, fresh and plush, this palate staining wine was delicious. Super wine with real, old vine intensity. The wine really packs a punch, in all the right ways. Fat, yet balanced, sweet, yet fresh, the wine is long, finishing with a blast of peppery, spicy, black raspberries and earth. This is a really fine expression of Chateauneuf du Pape. Served blind, not everyone liked it, but I loved its jammy, black raspberry, earth, kirsch and stone perfume. Although, at first, there was a hint of wood, which faded after about an hour in the glass. Rich, but not over the top, ripe, but not over ripe, the supple textured, pure finish was a pleasure to taste. There was no sensation of heat in the finish. I'd give it a few more years to develop additional levels of complexity before popping a bottle. Deep in color, the perfume is filled with black cherry liqueur, fennel, garrigue, pepper and jam. With great concentration, purity and depth of flavor, this rich, ripe, plush Chateuneuf du Pape is already delivering a lot of pleasure. From 100% Mourvedre, this was odly much tighter than expected. Popped and poured and served at a blind tasting, I was not able to spend ample time with the wine. The initial impression of licorice, kirsch, olives, garrigue and black cherry jam was there. But the wine felt like it was in reserve at the moment as the nose was much more interesting than the wine. Time, or air would probably add more to the experience. This is the debut vintage for this unique 100% Mourvedre wine. The grapes were previously used by the estate in their Chateauneuf du Pape Tradition. Big, powerful, and intense, the density is almost surreal. This is liqueur of Mourvedre. Even with its massive weight, it's impossible not to enjoy the pure, fresh, clean fruits. This wine is light on its feet, and it's also tannic. So if you are lucky enough to have a bottle, give it another 5-10 more years in the bottle. Still young in color, the array of spices is almost overwhelming. If that does not knock you out, the black and blue fruits, lusty textures and hedonistic palate feel will. Long and intense, give this a few more years for even more complexity and depth. The wine was made from a blend of 65% Grenache and 35% Mourvedre. Olives and tobacco add complexity to the dark red fruits and minerality. If you have a bottle, you can easily pull a cork to experience the lusty textures, full bodied, fresh fruits and sweet, peppery black cherries. Else you can age it a bit longer. This is the first vintage that was fully destemmed at the domaine. The wine was made from a blend of 75% Grenache, 15% Syrah and 10% Mourvedre. Full bodied, rich and concentrated, this shows a beautiful depth of flavor that serves up grilled steak, wet earth, spice and dark red fruits. Concentrated, long, fresh and richly textured, the finish continues with you, with more depth of flavor. The wine was made from 70% old vine Grenache and 30% old vine Mourvedre.